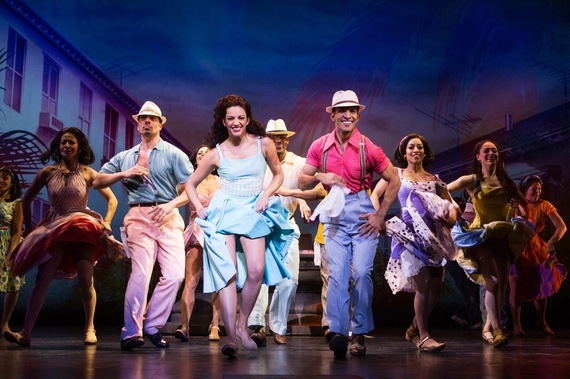 On Your Feet!, the musical of the life and music of Gloria and Emilio Estefan now playing at the Oriental Theatre through July 5, reminds me of one of my favorite lessons: You are never going to be any better than yourself. And the moment you change who you are for someone else, you disempower yourself. The musical tells that lesson and more in recounting the true love story that unfolded between Emilio Estefan, now a 19 Grammy-holding, powerhouse producer of many of the most successful Latin cross over artists of all time, but then a young, immigrant musician, and Gloria Fajardo, a young girl who loved to sing, but had no aspiration of being famous. Through incredible dancing, costumes and music, the audience learns that it wasn't just the music that bound them, but a desire to show the world their authentic, Latin selves. As Gloria said during an interview on a very busy red carpet minutes before opening night last Wednesday, "I think if you stay honest and true to who you are and what you want to portray and offer to the world, [you remain grounded]. They kept telling us, 'If you are going to be successful, you need to change your sound,' and we thought, 'Then we don't want to succeed, because then it's not going to be us.' We wanted to bring who we are to the world... When we were able to put our music out into the world, that was a blessing." Emilio reiterated this in his wonderful accent that hasn't changed much since he came to this country at 8 years-old, "Oh my God, the time that we started was so difficult, it was so hard to bring a new sound and not to change your last name, and we are proud tonight...It's about making America better and recognizing that we live in the best country in the whole world." It isn't just Gloria and Emilio that make On Your Feet! a very special production. I counted 32 people on stage in exhilarating dance moves choreographed by Sergio Trujillo (Memphis, Jersey Boys) and fantastic costumes by Esosa. Tony Award winner Jerry Mitchell directs and Academy Award winner Alexander Dinelaris wrote the book. He had this to say about collaborating with Gloria and Emilio: "I spoke with them for about two hours before I realized that it was going to be a good story to write. They are very real. They tell the truth. They are painfully honest. They are very open about things and I knew I liked them." I highly recommend On Your Feet! for the inspirational story, as well as the invigorating music which will take you back in time and restore your faith in love and the American dream. As Gloria says in the podcast above, "We have lived the American dream and this is quite a culmination of that!" Enjoy the podcast above and tickets are available here. Ana Villafane as Gloria. 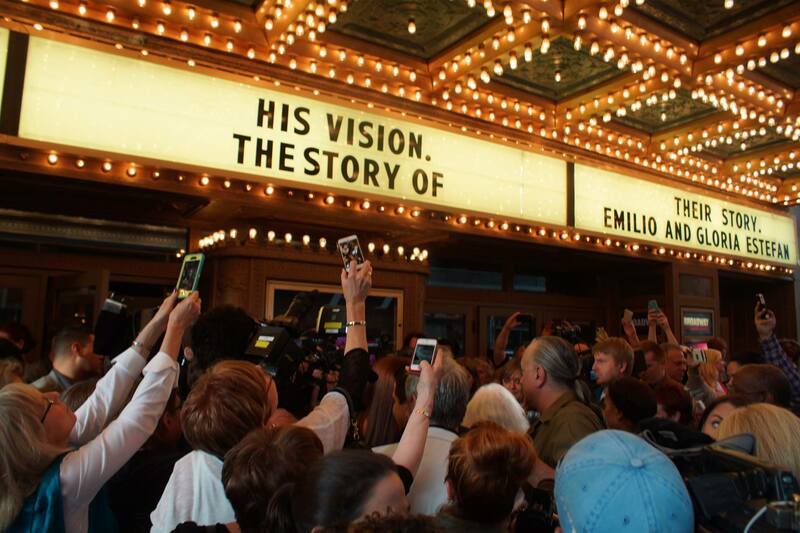 Photos courtesy of Broadway in Chicago. The madness of the red carpet. People hoping to get a glimpse of Gloria and Emilio Estefan. Photo courtesy of Tara Alfano.